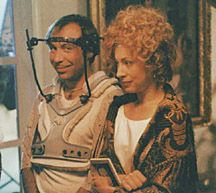 Taylor Negron is "Joshua Wilde", a former wedding singer now posing as a poet. After being injured in a freak skateboarding accident Peternelle throws a benefit party to raise money for his medical bills. Taylor is a gifted stand-up comic that has appeared in "Seinfeld", "The Ben Stiller Show", "Caroline in the City", "ER", "The Practice" and as a series regular on "Hope and Gloria". His film credits include, The Last Boyscout, Punchline, Mr. Jones, and Angels in the Outfield. He currently stars on the sitcom "The Hughley's."